According to HTTPArchive, around 64 percent of a website’s average weight is images. Furthermore, surveys from akamai.com and Gomez reveal that 73 percent of mobile internet users have experienced problems with page load times on their devices. A one-second delay in page load time can decrease visitor satisfaction by 16 percent and can lead to a drop in conversion of 7 percent or more. 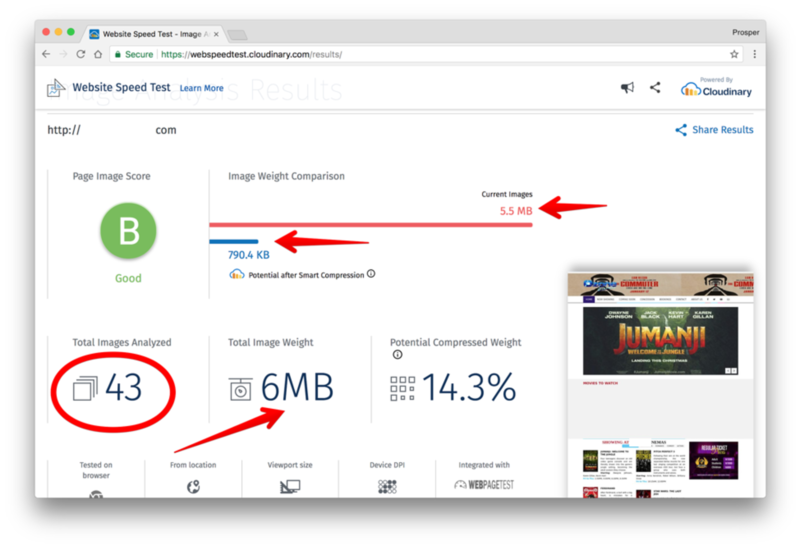 In this article, I’ll cover why a little discipline in image optimization can go a long way in helping your site load quickly on mobile devices and ultimately improve your mobile search ranking. Before making a decision, you need to identify the problem. In this case it focuses on which images on the site needs optimization, and on what part of the site are they concentrated? It’s really not that hard. Perform a detailed image analysis audit with the powerful Website Speed Test Image Analysis Tool. This tool provides information about the size, formats, quality and encoding of images on your site. Furthermore, it provides actionable tips on how to improve the page load speed. First image is too heavy. 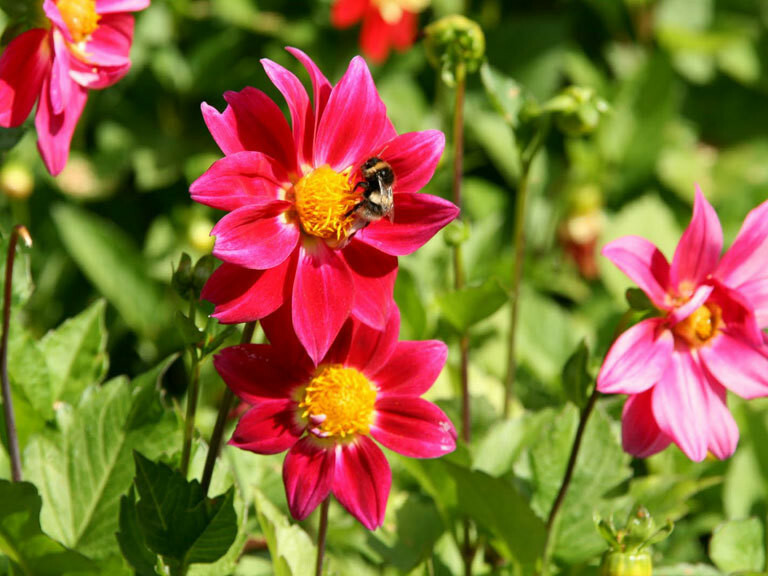 It can be optimized to be served as JPEG (28 KB), JPEG-XR (26.2KB), and PNG (141.5KB). Grade Analysis by the left. Optimization by the right. JPEG is supported in the various browsers shown just above the size. JPEG-XR is only supported in Internet Explorer and Microsoft Edge. No. 1 is a link that leads to the fix, which is the optimized image! 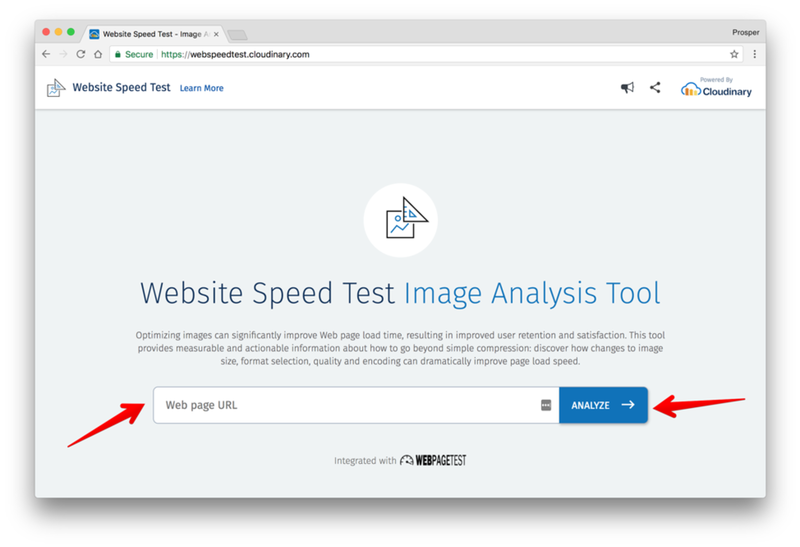 Eric Portis has done a great job of writing an in-depth article focusing on how the Website Speed Test image analysis tool works. 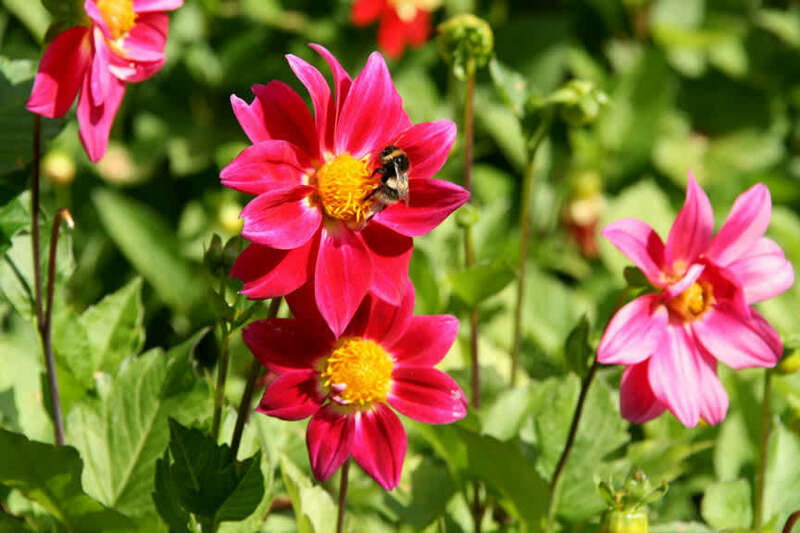 Let’s quickly go through a few image optimization techniques, all of which can be achieved easily with Cloudinary. Other options are qauto:best, qauto:low, qauto:good or qauto:eco to ensure higher-than-average quality. The q_60 parameter above decreases the delivered file size from 118KB to 73KB. Choosing the right format to deliver each image can result in significant file size savings without sacrificing quality. The f_auto parameter enables Cloudinary to analyze the image content and select the best format to deliver. For example, it can automatically deliver images as WebP to Chrome browsers or JPEG-XR to Internet Explorer browsers, while using the original format for all other browsers. 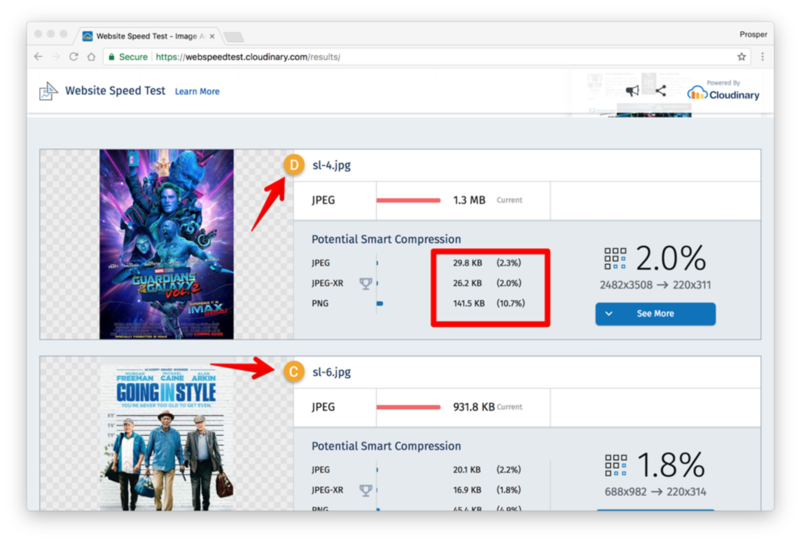 Using both f_auto and q_auto, Cloudinary will still generally deliver WebP and JPEG-XR to the relevant browsers, but might deliver selected images as PNG-8 or PNG-24 if the quality algorithm determines that as optimal. 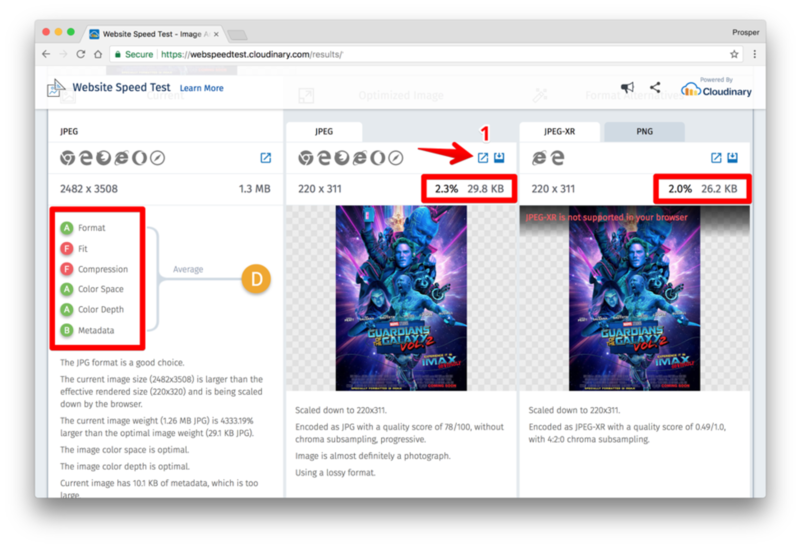 If you deliver full size images and rely on browser-side resizing (using CSS or HTML width and height attributes), users are forced to unnecessarily download large images. Therefore, images should always be delivered from the server at their final size. Cloudinary performs resizing on the server, thus enabling the image to be delivered to the browser at the requested size. The above example will yield a 318KB file on a DPR 2.0 device and 115KB on a DPR 1.0 device. It will be automatically scaled to the width available for the image in the responsive layout, and with a DPR value suitable for the user's device. One of the best ways to increase page performance is via image optimization. The faster your page loads, the higher the chances of achieving a better mobile search ranking. Don’t leave performance and mobile search ranking gains on the table, optimize your images today with Cloudinary!